We have to cast down this insidious idea that a socialist (anti-free market) system is best, lest there be no free market left with which to institute Capital Homesteading. It is clear from the policies being implemented by the current administration, that Mr. Obama will not be our ally. We must work to defeat these anti-free market ideals in the 2010 and 2012 elections. And we will defeat them, one brick at a time. But what do conservatives have to offer? There is a solution for saving Social Security and Medicare, for eliminating payroll taxes, and which will help all Americans to be able to provide for themselves. It’s called the Capital Homestead Act. 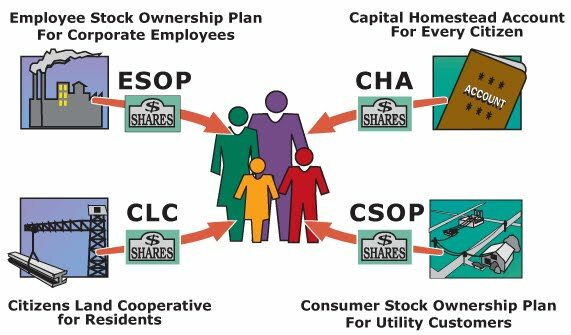 Generate millions of new private sector jobs by lifting ownership-concentrating Federal Reserve credit barriers in order to accelerate private sector growth linked to expanded ownership opportunities, at a zero rate of inflation. exempt from taxation the basic incomes of all citizens up to a level that allows them to meet their own subsistence needs and living expenses, while providing “safety net” vouchers for the poor. With all due respect to the author, the proposed legislation seems to me to be “more of the same” approach that has gotten us to this ridiculous economic/political debacle we now find ourselves drowning in. To be fair, some of the proposed solutions sound reasonable and display a spirit of compromise toward effecting meaningful change within a realistically brief time frame. While I realize that may be a huge assumption at this point in the process, I believe another approach is indicated, and more importantly would be substantially more palatable to the broader spectrum of taxpayers. You know, those forgotten souls that live outside the beltway who actually pay the bills. (1) Lose the ridiculous economic, legal, and political jargon. It angers taxpayers and sends up red flags. We've been fooled too many times by the “baffle 'em with BS crowd, inside the beltway. (2) Simplicity is a valuable tool for getting a message across. Use it! Believe it or not the KISS method still works and is appreciated. (3) Going back to a blank slate is not antithetical to progress. When facing levels of complexity, that clearly need simplification, starting over at square one can be a good thing. (4) Get rid of the FED entirely. (6) Back the USD with gold, silver, oil, gas, Aunt Martha's jewels, ANYTHING that has lasting intrinsic value. (7) In other words, quit playing “Monopoly” with the people's blood, sweat and tears. (8) Get rid of the Federal IRS and allow the states to assume responsibility to forward tax receipts to the Federal government, after it has been collected at the state level. That should instill some humility at the Federal level, don'cha think? (9) Change the tax system to a consumption or sales tax at one fixed rate for all consumers. This may then be adjusted to generate the necessary funding for the Federal government. (10) Get the Federal government out of the social services business and turn those duties and responsibilities over to the states, to be administered at the local level. That's where a voucher program, to assist those who are truly needy, may best function. (11) Specify, through litigation and subsequent SCOTUS rulings (if necessary), the limitations of the Federal government's use of the “commerce clause” to regulate Interstate Commerce. (12) If necessary, amend the Constitution to limit the scope and reach of the Federal government, with regard to the regulation of Interstate Commerce under the “commerce clause”. (13) Elect representatives to Congress who have the courage to pass the “Enumerated Powers Act”, and to override any veto that might be forthcoming. (14) And last but not least, establish term limits for all Federal elected officials. If it's good enough for the President, it should be good enough for everyone. This law should include the immediate (that is, prior to the next regularly scheduled election) “right of recall” by the respective constituents of any elected official, in the event of offenses by said official which may be found to constitute a “breach of contract”. In other words, they should be held to account by their constituents, such that they may be “terminated (immediately) for cause”, like any other employed person in this nation. Could it be made to work? Absolutely! May God have mercy on and bless America in this time of extreme trial and testing. Thank you for your comment. You make some great points, and I don't disagree with any of them. Capital Homesteading is a way to bring about economic justice, and it is essentially on the same page as you. Fixing term limits and abolishing the 'fed' are a little beyond the scope of Capital Homesteading, but not necessarily antithetical thereto. And thank you for your forebearance. Sometimes, in the heat of the moment, my insufferable alter ego (“Mr. Fixit Yesterday”) wrests control of my communication process, often with far too pointed a response. I perceive that we are both zealuosly searching for solutions to strengthen the obvious weaknesses in this country that we love. May our hearts be pure in our quest. May our vision be clear. And may our actions build an example of hope and service for all the world to see and strive for, in God's good time and according to His perfect will. Very eloquently stated. I find much comfort and strength in your words. its a informative post thanks for sharing it.